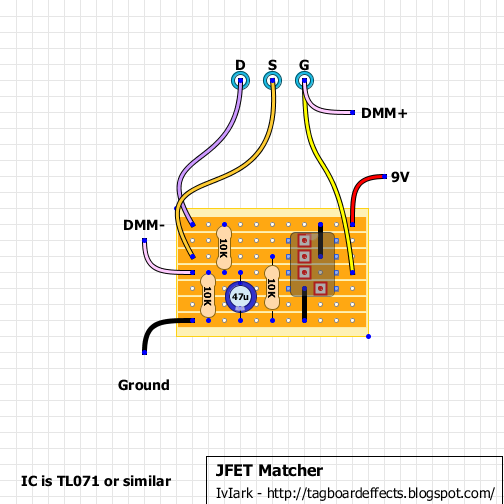 This should be a useful little circuit for a few people and will allow you to match JFETs VGS (or more precisely, the voltage at which RDS is 10K) when required in some phasers etc. Based on the information posted by RG here which should explain how everything works. Compact version with onboard sockets suitable for both DSG and DGS JFETs. This version with separately mounted sockets for JFETs. yessssss! thank you. I'm going to build this later on tonight. Bear in mind when you build it, it's worth setting up a second set of sockets for DGS pin layouts. 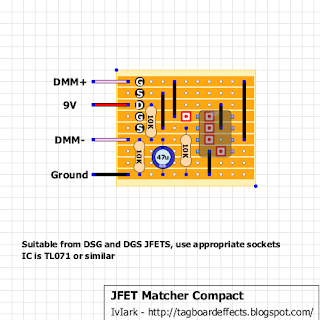 You can just daisy chain from the sockets shown so then you should be able to test the vast majority of different JFETs. My idea was to use a plastic box to house this and have the two sets of sockets mounted on the outside of the box and then maybe have banana sockets mounted to one side for you to connect up your multimeter. Then everything is kept neat and tidy and you have external access to everything you need. Yes that sounds fine and the 33uF cap is fine too, RG said you could use anything from 10u to 47u. I've added a version with onboard sockets above for people like you who want to keep everying together on the board. 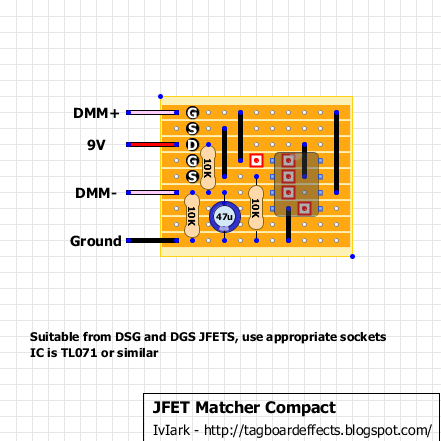 I've also included extra sockets so both DSG and DGS JFETs can be measured. Hey Mark, could I use LM741 instead TL071? Yes it should be ok.
Mark is away for a week. This may sound a little bit stupid, but how do you know which pins you connect? I see what I need to put in which place, but what do I need to solder? Each horizontal line has its pins connected together right? They're links, so only the top and bottom where the blue dots are. And what are those red squares with red dots inside them? So they're just breaks in connections. I have a board when every hole is separated, so I dont need to drill and cut anything, but I need to solder all those horizontal connections + jumpers of course etc. Yes, that's perfboard not stripboard. All these layouts are based on stripboard because I think it's simpler to break the tracks than create them. Having said that, some things work very well with perf because you can take advantage of vertical as well as horizontal lines if you're creating your own tracks. But I stick to stripboard just to keep a common form. What do you have your DMM set to? Its set OK, it shows 9V on battery or power supply. It also shows 4.5V on every resistor and 9V between 4 and 7 pin of TL072. 4.5V voltage on resistors is shown when my 2N5952 is in, without it there's 4.5V on only one resistor. Can you help me? I've inserted JRC 386 and it shows around 5.25V when there is no transistor, but when I plug 2N5952 it shows on all off them the voltage of 4.10V, while the max for them is 3.5V. OK hold on, I just spotted that I soldered capacitor in wrong direction. Clever, eh? I don't think you can use a JRC386 for this... that's an audio amp. You want a single channel op amp like a TL071. it doesnt work with TL072 either. which doesn't use any opamps. It works, thanks a lot for help guys! I built this and it works great. One question though. 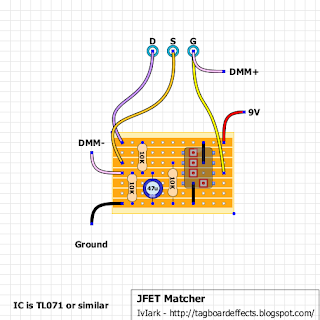 I don't have a power switch on mine, so when I insert and remove the JFETs, the power is always on. Is this bad for the transistors, to do that when the power is live? Should I add a little switch to kill the power for the insertion/removal process? Thanks! is this also good as a tester? on what i have to set my dmm, an what does it show, if the transistor is right oder defekt. I just managed to find 10 2N5457s and tested them. I got 5 between 3.14 and 3.17. is that close enough for matching them as a set?